LEDGlow's Advanced Million Color Mini SMD Motorcycle LED Lighting Kit features 4" flexible, multi-color strips that will illuminate your bike's gas tank, frame rail, fairings and more! 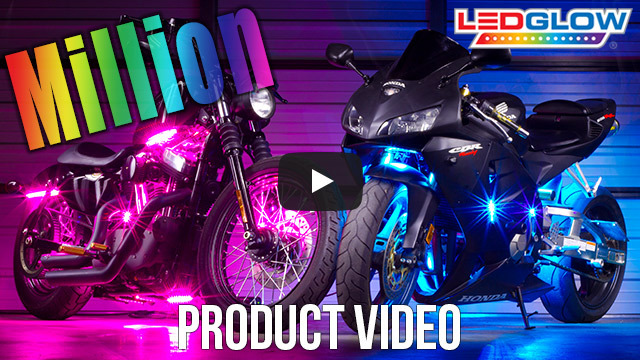 LEDGlow’s Advanced Million Color Mini Motorcycle Lighting Kit will illuminate your bike’s gas tank, frame rail or triple trees with a spotless, multi-color glow by utilizing ultra-bright, SMD technology housed in flexible 4" strips! What is SMD technology? An SMD chip consists of 3 concentrated RGB LEDs that work in unison to create the 15 solid color modes featured with the Advanced Million Color control box. 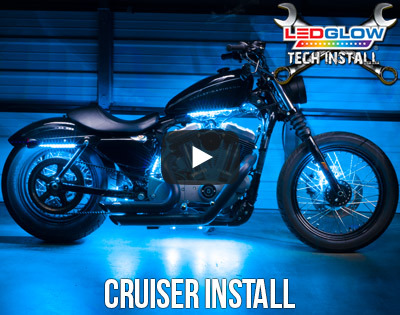 The SMD LEDs featured with this motorcycle underglow light kit are so small and bright that when you look directly at them, you cannot notice the red, green and blue LEDs that are used to create each solid color. This Advanced Million Color Mini Motorcycle Underglow Kit is offered in a 6pc Kit that features 24 SMDs (72 LEDs) and can be expanded all the way up to a 20pc Kit that features 80 SMDs (240 LEDs) for maximum brightness. Each 4" motorcycle light strip features 4 SMD LEDs and a thickness of 1/8" to be mounted virtually anywhere on the bike away from direct heat sources and moving parts. 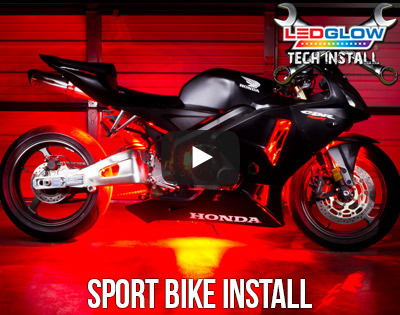 These Advanced Million Color Light Strips can also be cut to fit into smaller and tighter locations of your bike such as any fairing opening or front/rear fenders. The included waterproof control box is what drives this Advanced Million Color Mini Motorcycle Lighting Kit by featuring 15 vibrant solid color modes that include blue, green, red, white, pink, orange, teal and much more, along with 2 color cycle modes, 3 flashing modes and 1 fading mode. Each featured solid color or lighting pattern can be easily selected by utilizing the included four button wireless remote. The waterproof control box features a new, unique round design that measures at 1 5/8" in diameter and 5/8" in height, making it extremely easy to hide under the seat. Attached the control box is 18" of wire with a male modular connection that connects to the power harness and 12" of power and ground wires that connect to the battery. The power wire features a waterproof 2 amp inline blade fuse that protects the power circuit of the control box. LEDGlow's Advanced Million Color Wire Extensions easily connect to the power wires on your flexible SMD lighting strips to extend the 3' power wires in additional 1', 2', 3' or 5' lengths. This is perfect for larger bikes or lighting strips that are being mounted in locations further away from your control box. I own a 2014 Honda Grom and installed the 6 piece mini kit to be more visible in traffic at night. There were tons of videos online of examples/reviews and installation which were super helpful. Everything fit under my seat with tie downs provided in the kit. Works great! I have a 2007 Honda VTX 1800T which is a lot of bike to light up. I got the 6pc Mini kit with a 4pc add-on kit. For under $120, my bike looks amazing and I get a LOT of comments. They also help me stay more visible on the road at night. I would've just gotten the 8pc mini kit, but I wanted some 6" strips. As it turns out, the 4" minis would've worked just fine. The only downside is that there was a lot of wire that I had to stuff under my seat - you can't shorten the cables. I love everything else about it though!